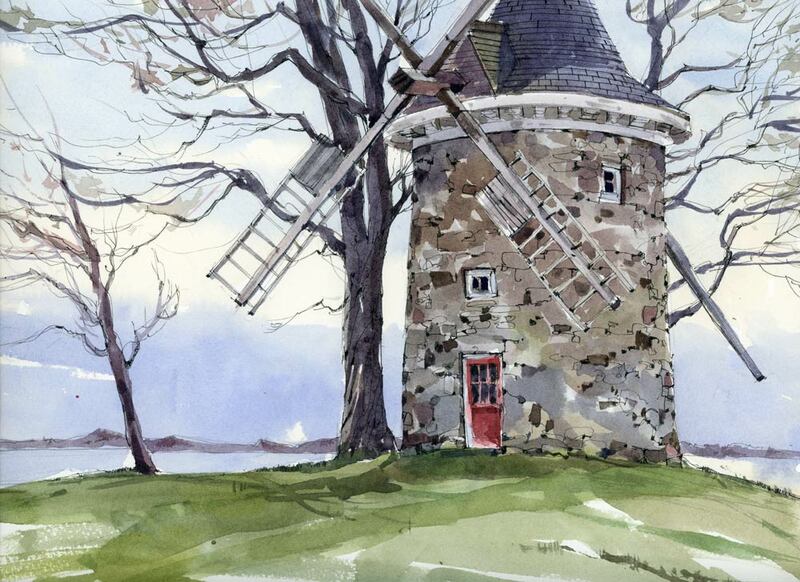 Sometimes scanning a sketch or painting allows me to see things I might not have previously noticed, like in this sketch of the windmill in Pointe Claire. The sky was very dark and dramatic at the horizon line today but I didn’t really paint it dark enough(see the top version). After scanning it a first time, I went back and rewet and darkened the sky, let it dry and then scanned it again. The difference is subtle but I think it adds a bit of drama and also helps in separating the sky from the lake. Definitely makes a difference, more ominous! Love that old mill, so Pointe Claire!!! There are only a few of these left. This summer I plan to sketch a few more of them. Apparently there’s an English style mill in Lasalle that is worth seeing too. For rocks and stone texture I make sure to change the colour of the wash as I go along. I try to make every square inch a little bit different, warmer or cooler, lighter or darker. Then I go in with some darker areas and build it up like that. I try not to mix up one big puddle of gray and paint the whole structure with that same mix. That’s so neat. I love that old stone windmill. I bet that gets a good breeze off the lake. Does it still work? See what you mean about subtle. In the second version the lower part of the sky looks fuller and more 3 dimensional though. It can be windy in that spot Fleet but it was actually a calm day. The windmill doesn’t work any more but there are lots of people who come by to see it every day. I even saw someone leading a guided historical tour there. I really like this piece. It looks like you might have used ink to delineate the cracks in the stone work? Looking at the zoom image I really like these lines. Must have been fun to do. Another thank you for discussing your technique. Yes, I used my Micron pen for this. I was working on Waterford NOT paper which takes both ink and watercolour well. Beautiful…..I love the detail in the stone. Ink at the stones? Very nice! Yes, actually there’s an ink line on everything. You did well, it’s subtle but it give more contrast. Beautiful ! 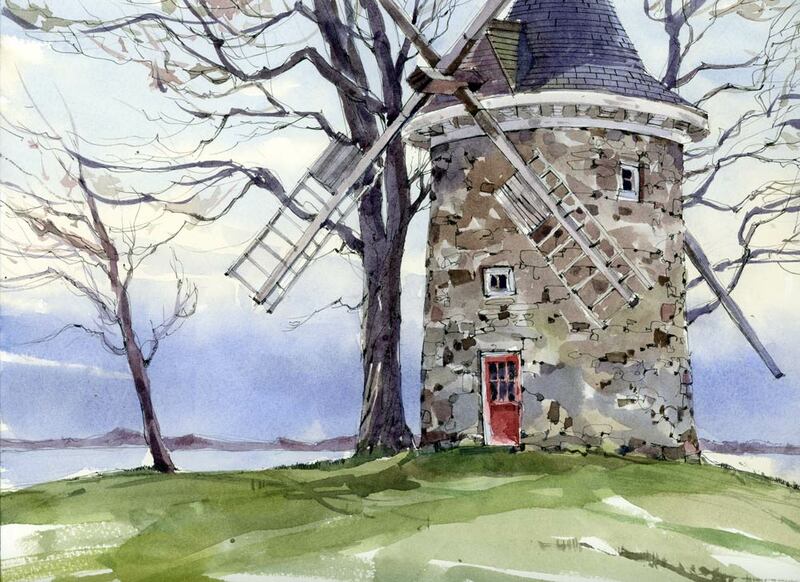 Stunning and deft handling of the colors on the windmill. It’s just one more lesson , to me, of the possibilities watercolor offer. There is nothing left to say – you are awesome, Shari. You are very kind George. Yes, I never get tired of watercolour. Your handling of the stone windmill is so effective. I like it so much that I’m jealous. I love painting those stone walls Lee. When you come to Montreal again I will bring you here.